Apparently we were on a peach kick last time I was at my parents' house. 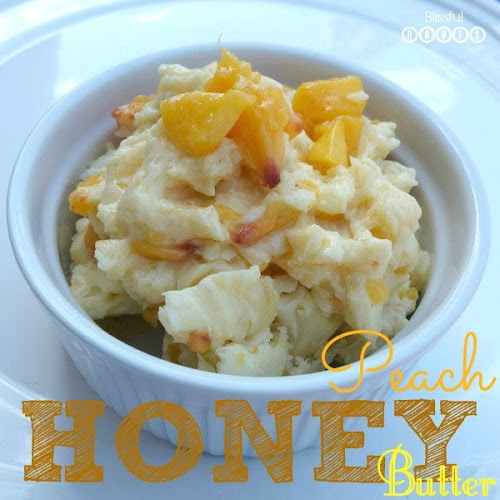 I posted a fresh peach pie recipe last week, and this week I have peach honey butter for you. We also tried this with strawberries, and I'm sure raspberries would be delicious, but this time of year peaches call my name. You probably don't even need a recipe for this one. All three ingredients are in the name, but here's proportions we used. Mix the honey and butter together, then fold in the peaches. If you want the peaches to stay in chunks, then don't over-stir. You could probably mash the peaches up if you don't like the chunks, to make a more uniform mixture. We like the chunks of peaches, so that's how we made it. This is amazing on homemade bread or rolls, and toasted English muffins. I'm sure it would be good on just about anything! Oh, and we do keep ours refrigerated. P.S. I have to give a shout out to our family friends who make the honey we're addicted to now. My boys were lucky enough to go and fill a jar straight from the source last time we were in Cache Valley. We love Slide Ridge Honey! If you live in Utah, check your locally owned grocery stores. I saw it in Days Market for the first time last week. They do have an online store as well. Yum! This looks delicious! It would be perfect on some fresh, warm homemade bread! That's our favorite way to eat this. Thanks so much for visiting, Shannon! Come back anytime, and enjoy your day! I promise it won't disappoint! I love using peaches in just about everything this time of year. Have a great day, Katie! Thanks so much for stopping by! Ohhh this sounds delicious, it would be so good on some toasted English muffins!!! YUM!!! English muffins are my favorite with this! The perfect combination! Thanks for taking the time to visit and comment, Maria. Enjoy your day! Pinned! This would be perfect on fresh-baked whole wheat bread. This sounds so delicious, Brooke! I've been on a peach kick lately too.....I still have some in my fridge for this butter! !